We have a pfSense box acting as a PPPoE and OpenVPN endpoint. This has been working flawlessly since we put it in February this year. Setup user with OpenVPN cert and exported x86 Windows .exe and installed on their laptop. Made sure the TAP Adapter was installed. User connected okay (and I can see they are connect via OpenVPN logs on the pfSense box). I can ping the client via pfSense and another machine on the subnet. This user is on Windows XP. Problems: I cannot remotely access the users laptop via VNC (but I can ping them). When I've TeamViewer'ed to the users laptop, I cannot access any services by name, only by IP address. Strange thing is, the DNS servers are correctly allocated (made sure by Netsh via CMD). And I can also do a NSLOOKUP on a server and it displays the correct IP! As soon as a try to ping a server internally, it just says it cannot find it. For the moment, I've connect this particular user up with direct IP (Outlook and RDP). This is messy and obviously services are subject to IP change. Can anyone shed any light? So far, Windows 7 machines with OpenVPN seem to be unaffected. Are you behind a Domain controller ? is Pfsense your Forwarder or other server ? 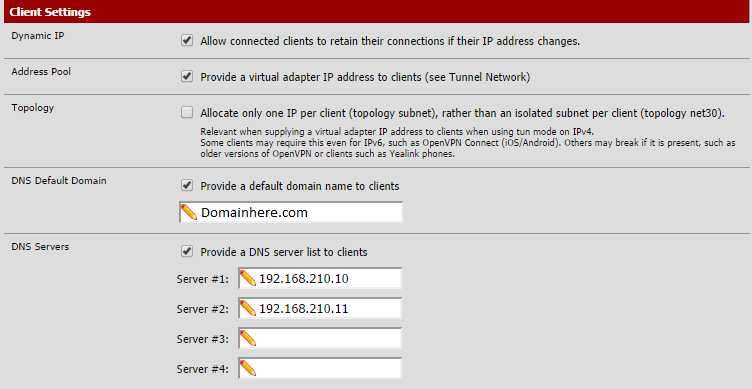 screenshot of your pfsense DNS setting please?